A fork in the path. Now I will always be “the person who turned left when he could have turned right”. I am blown right by a strong wind. Now I will always be “the person who was blown right when he might have chosen otherwise”. I become “the person who turned or was blown right left left right right right left …. when it could or might have all been otherwise”. 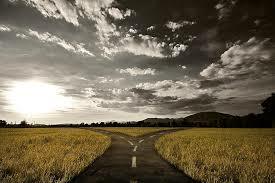 Our lives and ourselves turn into a circuitous route composed of when and where there was a chosen or a forced turn. Three sheets to the wind even when we’re not drunk. We cannot always tell if we chose or were blown. And surely we often cannot remember. Does it matter in a game where you cannot turn back? Long ago in a trailer in a forest I made a bad choice. That choice forced another and another. Now I regret the first choice but I am what I am now from all the others. What if I could go back and make that choice again? It would not be me that goes back to decide again. I am the ill formed progeny of that choice, no longer the innocent I once was. It would be that long-gone innocent making the new choice. But that innocent would soon become something else altogether once the new choice was made. That innocent self, even if wise enough to make a different choice, or let the wind choose, would now be a route I never took and utterly unrecognizable to me as me. How would he judge me? How would I judge him? What could the judgment of or by an alternative self really mean? Is this what the Final Judgment at the Gates of Heaven is? What are people who read self-discovery books seeking to discover? They say they want to know who they are. Better, I think, if you are young, to seek who you should be, though it won’t be what you become. But what you have become and what you should think of it. Is the proper emotion guilt?